One of the greatest modern conveniences is being able to sit at home and order things online and have them delivered to your door. This is clearly great for things like apparel, books, and other nonperishable, uniformly mass produced items. It is obviously not always the best for perishable, breakable, or unique items. So what about cigars? Cigars are somewhere in between. They are not perishable per se in that they can be rehumidified. They are easily packaged to avoid damage. And while they are not usually “mass produced” they are generally pretty uniform. So is it okay to buy cigars online? The short answer is sometimes. 1) Although cigars are not perishable per se, they do require proper storage. So obviously, unless you are having your cigars shipped to you inside a humidor, they are going to be outside of their ideal conditions for some extended period of time. This can be remedied by re-humidifying the cigars once they are received but this requires that you own a humidor. If you do not own a humidor or the person who you are buying the cigars online for does not own a humidor, it is probably not best to order cigars online. Their construction is tedious and important for the effectiveness of the smoke. For this reason, limiting the amount of time your cigars are handled and transported is ideal. Further, the best packaging may not always withstand the treatment of the United States Postal Service. Buying cigars online does involve some damage risks. 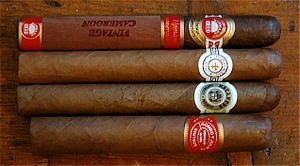 3) Cigars are relatively uniform due to the way they are constructed. But they are still susceptible to mistake. Some may be misshapen, dented or cracked. Some may have been constructed poorly or stored and handled poorly. The problem with buying cigars online is that you don’t get to see them before hand. 4) Shipping involves time and money. You have to wait for your cigars to get to you so you’ll have to account for that in comparing the cost of buying cigars from a tobacconist and buying cigars online. You also have to pay extra for shipping so this may cut down on the value unless you are buying in bulk. All in all buying cigars online is usually okay, but should not be done without considering some things. Once you find a trusted site for buying cigars online you should be good.